The BenQ HT2150ST is a best-in-class gaming projector worth every penny for those that care about image quality and latency above all else. In theory, projectors like the BenQ HT2150ST are an incredibly smart option for gamers looking for a new display. You get to enjoy a massive screen size (larger than most TVs) without having to deal with any of the logistical nightmares associated with delivering, moving, and mounting a traditional TV. Not only that, if you ever want to rearrange your room, change the projector to another room, or are planning on moving, it’s one less thing to worry about. However, projectors typically trail traditional TVs on resolution, and generally introduce more latency/input lag than gamers would prefer. For the uninitiated—latency is the delay between an action, like pressing a button on your controller, and the result, such as when the display updates the image. If you’ve ever tried playing a game on a TV only to feel like you can’t aim as well or steer as precisely as you’d like, input lag could have been the culprit. The good news is that the BenQ HT2150ST makes great strides in the input lag department, bringing this figure down to a perfectly acceptable 16.67ms—lower than most people will be able to detect. This is one of the central features of this particular projector, and one of the reasons it’s marketed specifically to the gaming crowd. 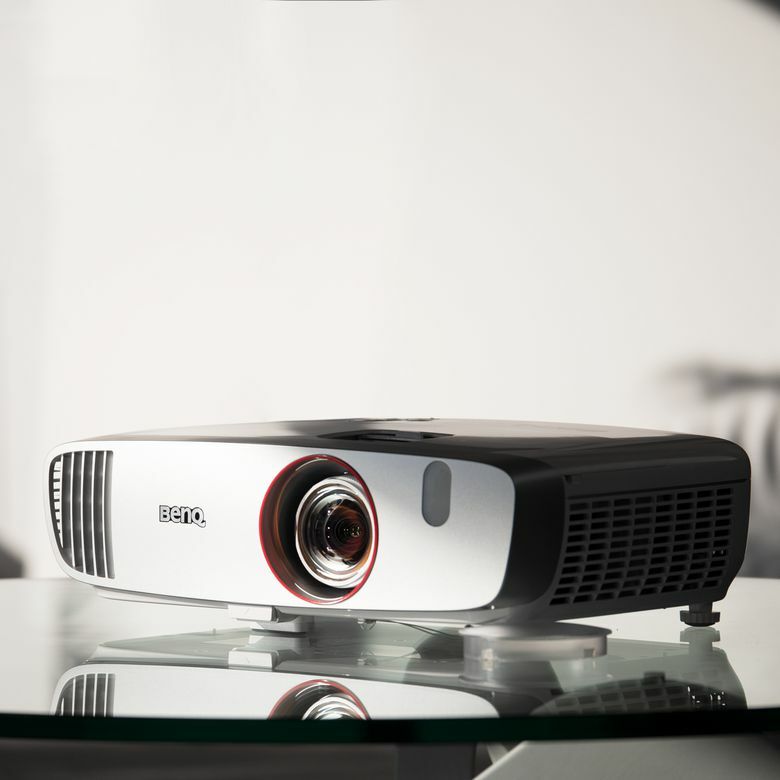 The BenQ HT2150ST is an attractive, capable projector with plenty of connectivity. Measuring 14.98 x 10.91 x 4.79 inches (HWD), this is not a petite device. It will take up a sizeable amount of room on a coffee table, and certainly won’t go unnoticed when mounted to your wall or ceiling. Make sure to take note of the dimensions and get a sense of whether or not this will work in the environment you plan to use it. The top of the projector contains the control panel (featuring OK, Power, Keystone/Arrow keys, Back, Source, and Menu buttons), the focus ring, zoom ring, an IR remote sensor, and indicators for temperature, power, and lamp status. As for ports, the BenQ HT2150ST gives you: two HDMI ports, one with MHL support; a USB-A port for charging the Wireless FHD kit, which we will discuss later; a USB mini-B port, for servicing the device; a 12VDC output to trigger external devices like powered projector screens or lighting control; 3.5mm audio input and output jacks; an RS-232 control port to interface with PC / home theater control and automation; and a PC/component video port. We don’t imagine most users will make use of a lot of these options, but they definitely provide a lot of room for growth if users want to explore more advanced home automation setups. In the box, the BenQ HT2150ST comes with a carrying bag, quick start guide, remote control (batteries included), power cable, user manual CD, and of course the projector. Not included is an HDMI cable or any kind of video connectivity, so make sure you’ve planned for this before your projector arrives. Turn on the projector, and follow the simple five-step setup process to start using the device. You’ll be asked whether you want to have it automatically choose a source, choose the orientation in which you are setting up your projector (low front, high front, low back, high back), set your language preferences, choose between basic and advanced menu settings, and go through keystone correction to account for any changes in the angle (up to 20 degrees). Simply put, you will be hard pressed to find a more capable 1080p gaming projector. If you’re using a coffee table position, the next adjustments you should make are with the quick-release adjuster and rear adjuster feet, which can be used to adjust the pitch of the projector and fine-tune the horizontal angle, respectively. Once you are happy with the position, use the two rings on the top of the lens compartment to adjust the zoom and focus to get a desirable image size and clear image. For most people, especially those using the projector from a coffee table position, these might be the only setup actions necessary. For those mounting their projector from the ceiling, or trying to fit their projection to the exact dimensions of a projector screen, BenQ has included a table to help obtain the preferred image size in the user manual. One last thing worth mentioning is that when it comes time to replace the projector lamp (as will eventually be the case with many projector types), the BenQ HT2150ST user manual provides very thorough step-by-step instructions on how to do so, including illustrations. See more reviews of our favorite projector screens available for purchase. With that out of the way, we can move on to one of the best parts of the projector—its short throw lens. Capable of delivering a 100-inch image from just 4.9 feet away, the BenQ HT2150ST gives buyers a fantastic projection experience that will work in just about any room configuration. Those living in small apartments, dorms, or working around similarly tight room constraints will certainly benefit from this. A 1.2x zoom gives you a decent amount of play with your picture size, allowing for more flexibility in projector placement. This might not seem like a huge deal at first, but once we started setting up the projector and dealing with the practicalities of finding the best placement and projection surface, we quickly felt the benefits of this feature. Capable of delivering a 100-inch image from just 4.9 feet away, the BenQ HT2150ST gives buyers a fantastic projection experience that will work in just about any room configuration. An equally important design feature for some, even though it is not highlighted quite as often, is noise. Nothing breaks immersion in a gaming experience more than hearing a loud roar of a fan when trying to listen closely for footsteps in a competitive FPS or dialogue during a cutscene of an RPG. Luckily, the BenQ performs very well in this category, delivering whisper quiet fan performance and doing a great job of creating as few distractions as possible. Take a look at our guide to short throw video projectors. Image quality is definitely the main attraction for the BenQ HT2150ST. The picture is bright and sharp from corner to corner, with excellent color and contrast performance. We were particularly pleased with how great performance was out of the box. The 2200 ANSI lumens provide plenty of light in dim-to-moderately-lit rooms, but will still suffer in direct light. A 15,000:1 contrast ratio looks beautiful in ideal viewing conditions, and is sure to impress. Users shopping for picture quality first and foremost should be more than satisfied with their purchase. The ideal placement for the projector is between 3 feet (for a 60-inch image size at maximum zoom), and 10 feet (for a 180-inch image size at minimum zoom). Keep this in mind when planning your projector placement. The zoom will also come in handy when trying to fine-tune your placement. The only place the BenQ HT2150ST loses marks is with brightness uniformity. It might not be plainly visible during normal use, but during testing, the difference in luminance from edge to edge is definitely noticeable. The picture is bright, tack-sharp from corner to corner, with excellent color and contrast performance; we would almost feel selfish to ask for more. One typical area of concern for single-chip DLP projectors, which essentially operate by spinning a wheel containing red, green, and blue colors in very quick succession, is the “rainbow effect”. Since the image is essentially comprised of three separate colors projected asynchronously, a fast-moving object on the screen can cause a perceptible color halo effect to become more apparent to the user. BenQ overcomes this by using a larger 6x speed color wheel with a RGBRGB configuration (which allows for twice the frequency of colors displayed per rotation). Essentially, by showing each color in much quicker succession, the rainbow effect becomes nearly undetectable, and both color accuracy and brightness benefit as well. The BenQ HT2150ST has 7 preset picture modes: Bright, Vivid, Cinema, Game, Game (Bright), 3D, and User. By default, the projector opts for the Game mode, which is sharp and bright, but a little on the cool side. Game mode has only 16.67ms of input lag, and gamers will want to stick to this option when possible. Cinema mode creates a very natural looking picture that users might want to opt for when they are using the projector for things other than gaming, but Game mode was perfectly acceptable to us for all the different types of media we tested on it. The other modes, such as Game (Bright), Vivid, and Bright, all attempt to accommodate viewing situations that are less than ideal by boosting brightness and saturation or cranking sharpness. We don’t recommend it since we found the image quality was compromised too much to be worth it. Check out our guide to buying the right projector. The BenQ HT2150ST has two 10-watt speakers inside them that do a comparable job to a small television, but we would still recommend connecting external speakers when you get the chance. Admittedly, the audio is noticeably better than most other projectors we’ve tested, but that’s fairly low bar. The only audio output on the projector is a standard 3.5mm auxiliary output, which you can use to route audio to your sound system. Alternatively, you can separate the audio signal at the source by having your game console send audio over an optical out to a receiver. When this option isn’t possible due to restrictions of your source device, you may want to purchase an HDMI audio extractor/de-embedder, which enables you to split the outgoing HDMI signal into your preferred audio format. These devices can be had for around $25 and provide a lot more flexibility for the future. The BenQ HT2150ST is light on software and doesn’t contain any smart TV functionality or expandable apps. The projector does support wireless streaming via a wireless FHD kit (WDP02) to the tune of $399. This kit allows you to stream the signal up to 100 feet away (within line of sight). For those that don’t want to deal with routing cables across long distances, or having multiple devices to connect to the projector simultaneously, this might be a good option. The streaming kit supports up to four HDMI inputs. At an MSRP of $799, the BenQ HT2150ST is by no means a budget option, and paying such a high price for a 1080p display in 2019 might seem undesirable. That said, unparalleled screen size, convenient portability, and a cinematic experience make projectors a truly unique offering, even in a world of 4K UHD smart TVs. Given the overall image quality and class-leading performance, we have to say that the price is appropriate. Take a peek at some of the best high-end projectors you can buy. Both of these projectors are fantastic looking, but the main points of differentiation are in color performance and throw. The BenQ HT2150ST leads the pack when it comes to color performance and contrast—the RGBRGB color wheel really does deliver better colors and a less noticeable rainbow effect. The Optoma GT1080Darbee, on the other hand, wins out on throw ratio (0.49 vs the BenQ’s 0.69-0.83), making it a clear winner for those in particularly small projection environments that don’t want to compromise on screen size. The Optoma is also significantly smaller than the BenQ, and will make a better coffee table option when space is a concern. Both of these projectors boast ~16ms response time s, making them ideal for gaming scenarios. The 1080p winner for gamers. ﻿Simply put, you will be hard pressed to find a more capable 1080p gaming projector. This is the kind of projector that will serve you for a long time, and impress any guests lucky enough to be invited over for movie/gaming nights in your home. In a perfect world, this projector would also be 4K capable, have triple the ANSI lumens, and better brightness uniformity, but for less than $1000, we love what the BenQ HT2150ST gives us. Product Dimensions 4.8 x 15 x 10.9 in.